Costa Blanca. Cabo de Gata tot Dénia en inclusief Ibiza. Imray M12 Costa Blanca. Cabo de Gata tot Dénia en inclusief de oversteek naar Ibiza en Formenterra. On this 2018 edition the latest depths and other general updating has been applied throughout. 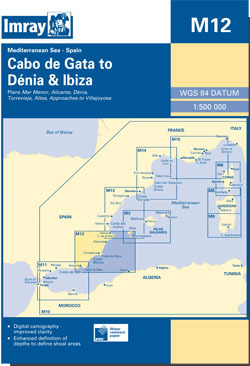 Harbour developments are shown at Alicante and Torrevieja.